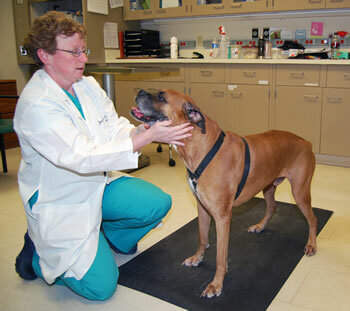 Joan Coates currently is seeking clinical trial participants to evaluate a treatment for canine DM. In 2009, Joan Coates, a veterinary neurologist, along with other researchers at the University of Missouri and the Broad Institute at MIT/Harvard, found a genetic link between degenerative myelopathy (DM) in dogs and amyotrophic lateral sclerosis (ALS), or Lou Gehrig’s disease in people. Now, MU researchers Coates and Michael Garcia, an associate professor in the Division of Biological Sciences, have found that a biomarker test that helps diagnose ALS also can assist with determining a diagnosis for degenerative myelopathy. Coates is seeking clinical trial participants to evaluate a treatment for canine DM. In dogs, DM is an older adult onset disease that can eventually lead to paralysis. The neurodegenerative disease has been confirmed in more than 30 pure bred dog breeds, such as Pembroke Welsh corgis, German Shepherd Dogs and boxers, as well as mixed breed dogs. The current genetic test for DM can be useful to breeders and veterinarians in identifying risk for the disease; however, it has limitations when diagnosing DM. ALS can be tested using phosphorylated neurofilament heavy proteins (pNF-H) that are released into spinal fluid and blood in humans with ALS. These biomarkers are released during the degeneration of spinal tissues making them a good indicator that ALS is present. Coates and co-principal investigator Garcia tested whether the diagnostic tool could be used in canines. Cerebrospinal fluid and blood samples were collected from DM-affected dogs, including dogs that had a confirmed diagnosis as well as dogs in early stages of the disease. pNF-H concentrations from those samples were compared to samples from age-matched normal dogs and dogs with mimicking diseases. Collecting cerebrospinal fluid from patients is more complicated than a blood test, but is less expensive compared to an MRI to make a presumptive DM diagnosis, Coates said. Nonetheless, pNF-H may serve as a diagnostic tool for diagnosis of DM. Coates also is conducting clinical trial research for treatment of DM. The goals of the therapies being tested is to slow the progression of neurologic signs of DM and improve quality of life. These therapies are in collaborations with other ALS researchers and funded by the ALS Association and National Institutes of Health. The clinical trials are taking place at the MU Veterinary Health Center (VHC) Small Animal Hospital. To inquire about enrolling a dog, contact Coates at coatesj@missouri.edu. Collaborations among human health and veterinary clinicians and researchers highlights the multidisciplinary, One Health/One Medicine initiative at Mizzou. The concept is a worldwide strategy for expanding interdisciplinary collaborations and communications in all aspects of healthcare for humans and animals where biomedical research discoveries and expanding the scientific knowledge base lead to faster improvements benefitting both humans and our pets. The study, “Cerebrospinal Fluid Levels of Phosphorylated Neurofilament Heavy as a Diagnostic Marker of Canine Degenerative Myelopathy,” was published in the Journal of Veterinary Internal Medicine. Christine Toedebusch, a veterinary neurology resident and doctoral candidate, was lead author on the study. The study was funded in part by the American Boxer Charitable Foundation and the American Kennel Club Canine Health Foundation (Grant #2165). The content is solely the responsibility of the authors and does not necessarily represent the official views of the funding agencies.